Doncaster Sheffield Airport , otherwise known as Robin Hood Airport, is located 8 Km south east of Dancaster, close to the M18 motorway. This new airport only started operating as an International airport in 2005, having previously been a military airbase - it has a brand new terminal and one of the longest runways in the country. A dedicated shuttle service links the airport to Doncaster Railway station (a distance of approximately 10 Km) every 30 minutes at peak times. A total of 6 bus routes link Robin Hood airport with local towns. 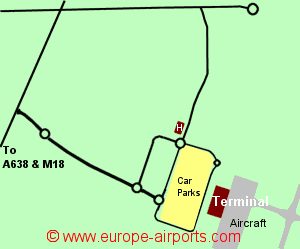 Car Parks are located immediately opposite the terminal building. Doncaster Sheffield airport has 3 bars/cafes/restaurants, 2 shops, currency exchange, WiFi Internet access. The 3 star Ramada Encore Doncaster Airport Hotel lies 300m from the terminal building, offering accommodation and meeting facilities. Robin Hood airport handled 1.3 million passengers in 2017, an increase of 6% from the previous year, and the busiest year yet.